Thanksgiving Interactive Emergent Reader, plus Word Wall, Stick Puppets, more. 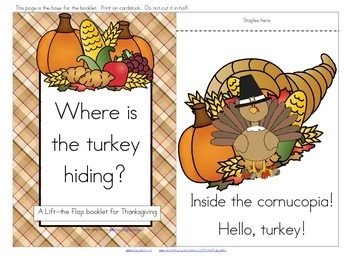 Thanksgiving turkey emergent reader : A Lift-the Flap booklet for Thanksgiving: Where is the Turkey Hiding? This book features positional words/prepositions. IMPORTANT: Click on the PREVIEW link to see all pages, and to make sure this is the educational level you are looking for.